B and I were in Whistler a few weeks ago for Crankworx and decided that, rather than have dinner at our usual Whistler hang-outs (Araxi or Rim Rock), we would try Bearfoot Bistro for the first time. I hadn’t been before but I’d heard some pretty great things about Bearfoot, particularly about the Champagne Lounge and the Vodka Ice Room. It was about time that I experienced it for myself. The restaurant feels as though it caters to a slightly older clientèle, with live piano music and a more traditional look for the bar and restaurant décor. Along with the Champagne Lounge and Vodka Ice Room, there is also an outdoor patio where you can have a few drinks before you start your meal, or curl up by the outdoor fireplaces for some post-dinner drinks. To the best of my knowledge, guests can only order the tasting menus (no à la carte) but that’s OK as Bearfoot offers a ridiculously affordable summer dinner menu with 5 courses at $68. The menu was well-executed, although not unlike what you would get at Araxi or Rim Rock. 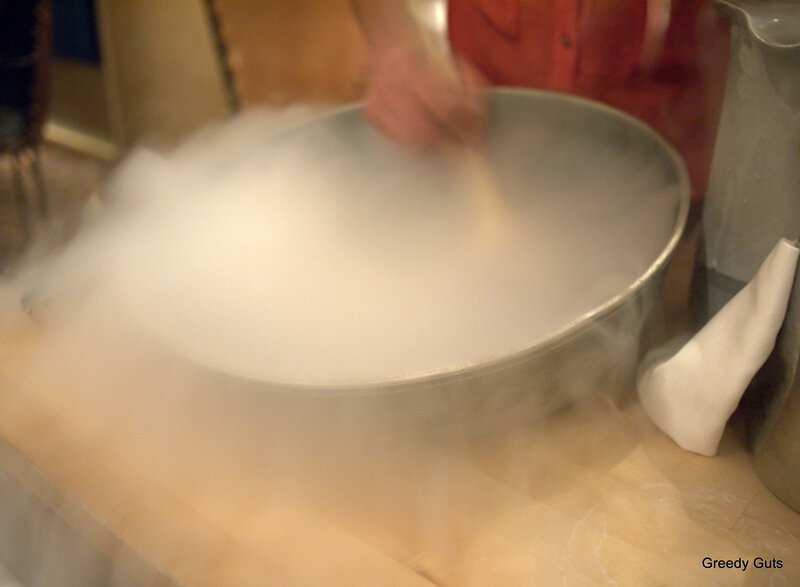 For me, the best part of the evening was the Nitro Ice-Cream, which was vanilla ice-cream made table-side using liquid nitrogen. It was pure theatrics and I lapped it up. What’s not to love about a bit of theatre with your dessert? 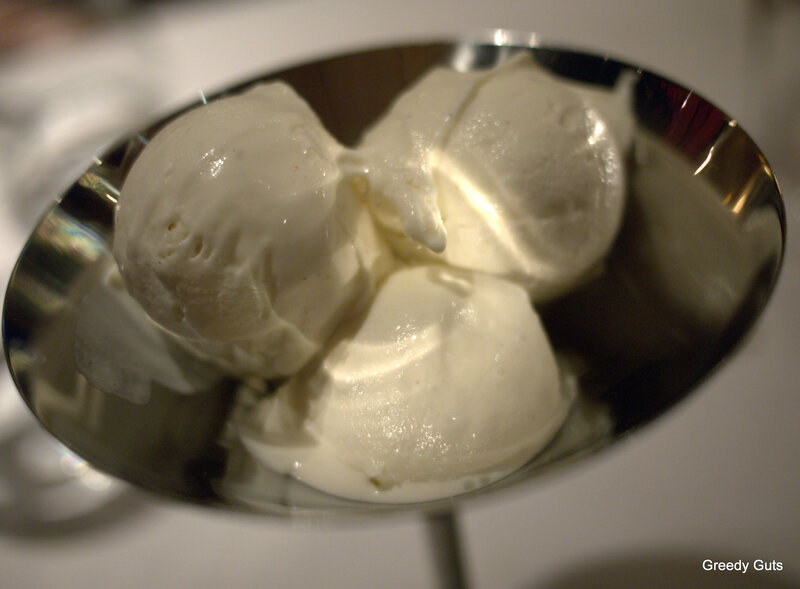 Thankfully, it wasn’t just all gimmicks and tricks – the ice-cream was excellent and was served with a variety of toppings – the salted caramel sauce was my personal favourite. Besides the ice-cream, the food didn’t blow me away but all in all, we had a lovely evening and I wouldn’t hesitate to recommend a visit to Bearfoot Bistro. Araxi’s Long Table Series – Coming to Vancouver! Now that I have safely secured my tickets, I can share with you more details about Araxi’s Long Table Series that is going to be held over the summer. Usually the Long Table events take place in the Whistler area but this year we Vancouverites will not have to travel far in order to enjoy some of Araxi restaurant’s delicious seasonal food and BC wine pairings. 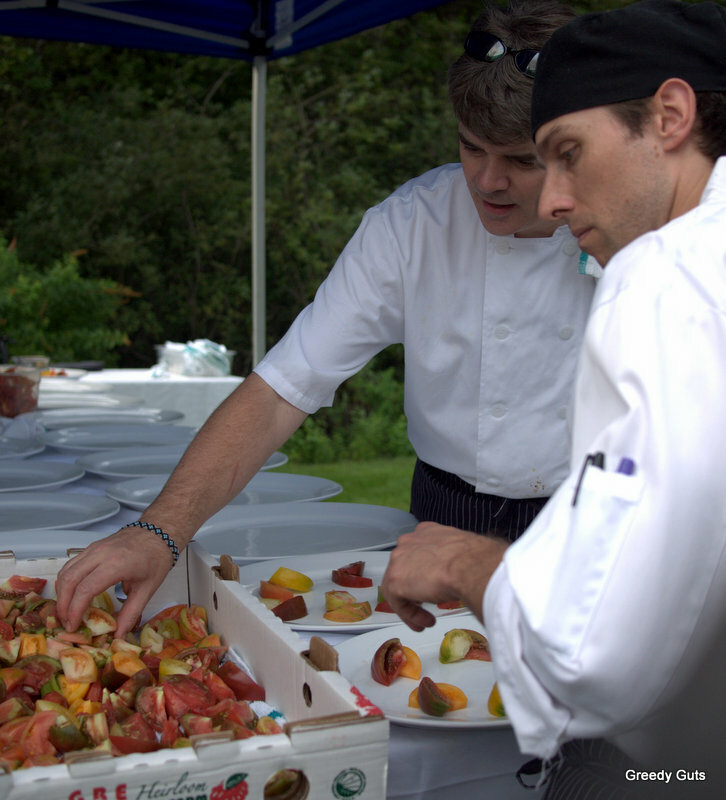 On Saturday, July 27, Araxi will be bringing their annual Long Table Dinner to Prospect Point in Stanley Park. 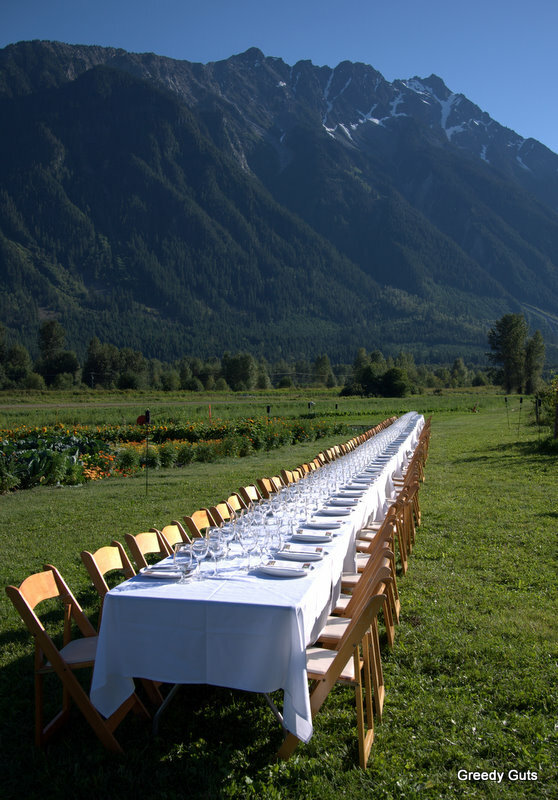 2011’s Long Table Dinner at North Arm Farm – nothing short of spectacular! Having already attended two of these events (one at North Arm Farm and the other at Rainbow Park) and knowing how fun they can be, I am excited to enjoy this experience closer to home. Tickets are $175 each and, yes, that may seem high but keep in mind that includes a cocktail reception, a four course meal, and wine pairings. 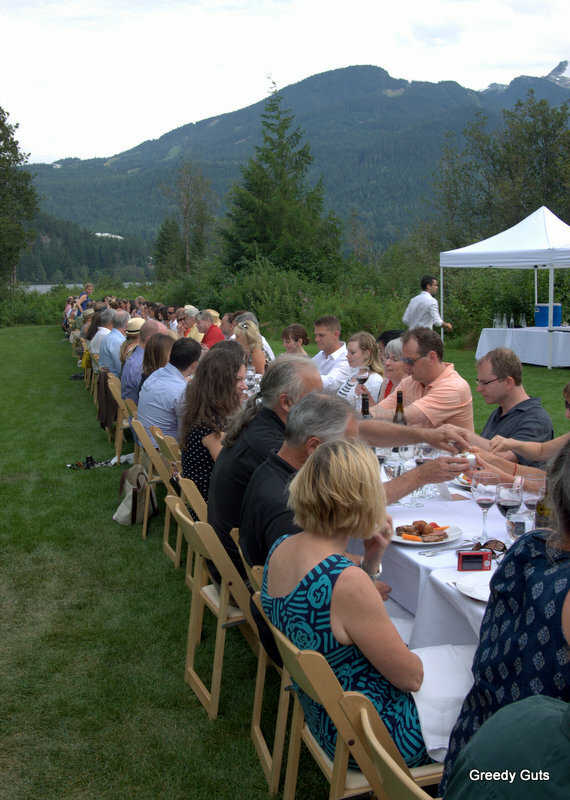 Plus, how often do you get to have an alfresco dinner with 300 people? 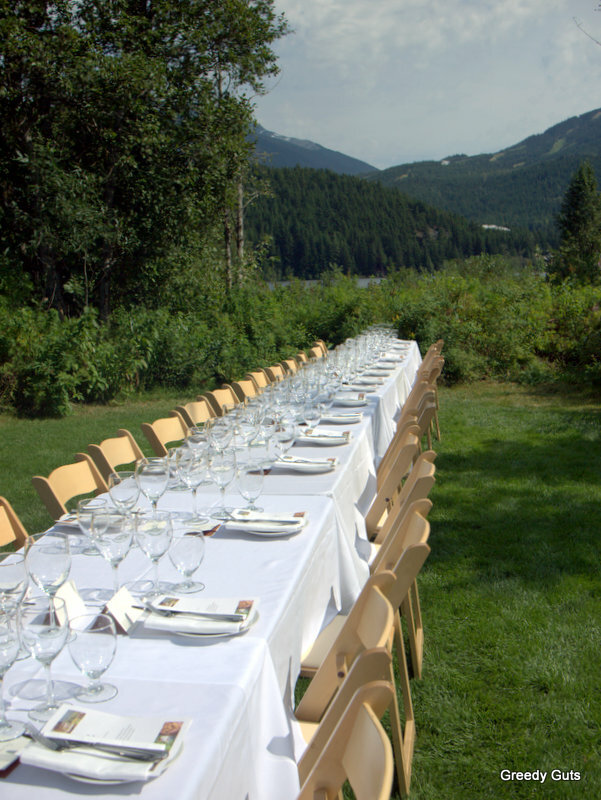 If you do find yourself in the Whistler area this summer, I highly recommend partaking in one of the Long Table Dinners whilst you are there. The North Arm Farm site is breathtaking and you can participate in a tour of the farm whilst you are there. It’s baaaaack! 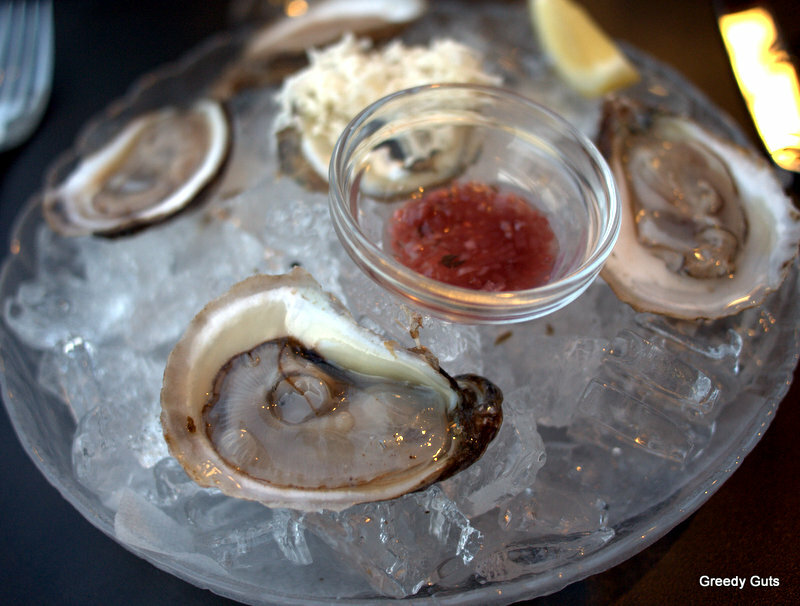 Since Wednesday food and wine lovers have been flocking to Whistler to enjoy Cornucopia 2012. Some travelled for the wine events and parties, and others (like myself) travelled for the food. We decided to focus on just one event this year and we chose Araxi’s Big Guns Dinner as we had such a memorable experience last year. We were not disappointed that this was the only event we attended, as Araxi did what it does best, and wined and dined us with carefully selected wines and a well-executed menu. The reception began at 6pm and we were treated to flutes of Billecart-Salmon “Brut” Champagne and an array of hors d’oeuvre. I was glad to see that Araxi had changed up their selection of hors d’oeuvre as we were quite familiar with them after attending a number of events at Araxi over the past year or so. 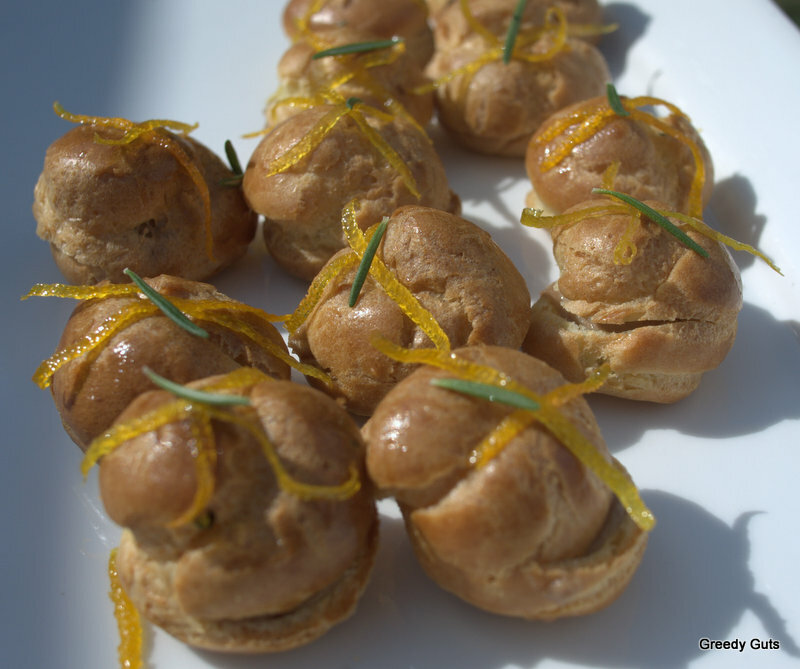 In constant circulation were cups of sunchoke and potato veloute, Hollie Wood’s Zen oysters with cucumber pearls, octopus takoyaki with yuzu mayonnaise, and my personal favourite, the duck liver parfait on brioche. Once we were seated, the next few hours went by in a dizzying state of plate after plate of gratifying dishes, paired with glasses of phenomenal wines. Course 1: Trio of Chilled Seafood. Tofino dungeness crab in egg crab with salsa verde, battera sushi of BC albacore tuna with yellowtail, and red tuna tataki with pearls of ponzu. Wine pairing: Casa main “Cipresses Vineyard” Sauvignon Blanc 2011, San Antonio Valley, Chile. Thoughts: The crab and egg crepe was wonderfully light and delicate, and the ponzu pearls added a depth of flavour to the tuna tataki. The wine had a strong bouquet and was a light start to the meal. Course 2: House Hot Smoked Salmon and Wild Shellfish Soup. Served with Root Down fall vegetables and salmon cavair, fennel pollen, and lemon thyme. Wine pairing: Gaja “Gaia & Rey’ Chardonnay 2009, Langhe, Italy. Thoughts: The shellfish soup was absolutely divine and the salmon was perfectly cooked throughout. I heard a lot of people talking about how much they enjoyed the Chardonnay, however, I found it was my least favourite wine of the evening. Course 3: Roasted Saddle of Rabbit and Alba Truffles. 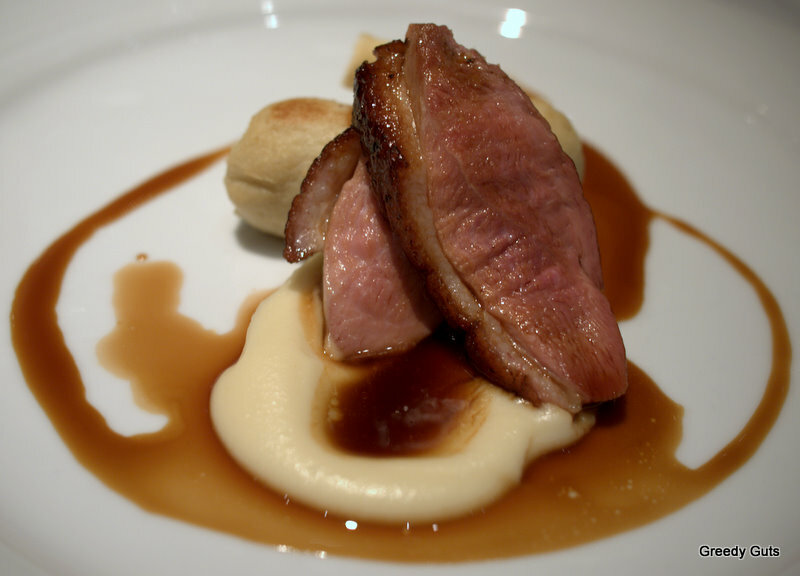 Finished with shaved white and black truffles with house made bacon, and Across the Creek farm pomme puree. Wine pairing: Louis Jadot “Corton-Pougets” Grand Cru 1999, Burgundy, France. Thoughts: Although there were many wonderful dishes throughout the night, this course was my favourite dish of the night. 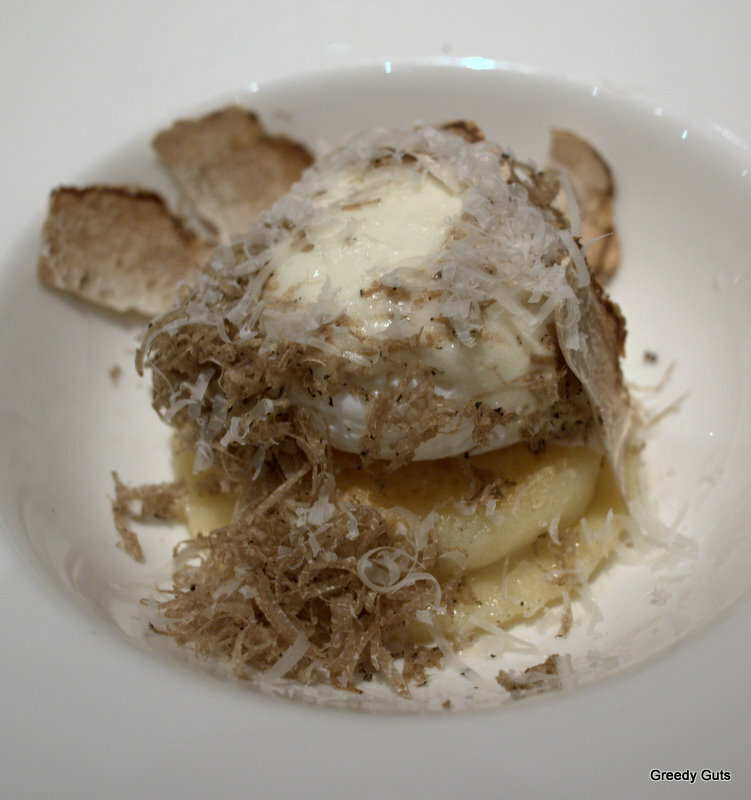 The earthiness of the truffle shaving paired very well with the tender rabbit. 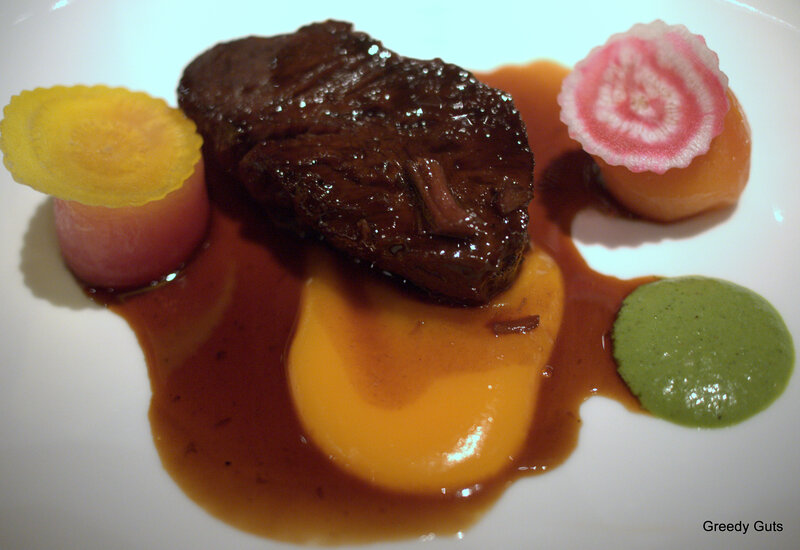 Course 4: Waygu Beef Cheek. Served with North Arm Farm butternut squash and assorted beets and topped with grilled chimichurri sauce. Wine pairing: Kosta Browne Pinot Noir 2010, Russian River Valley, USA. 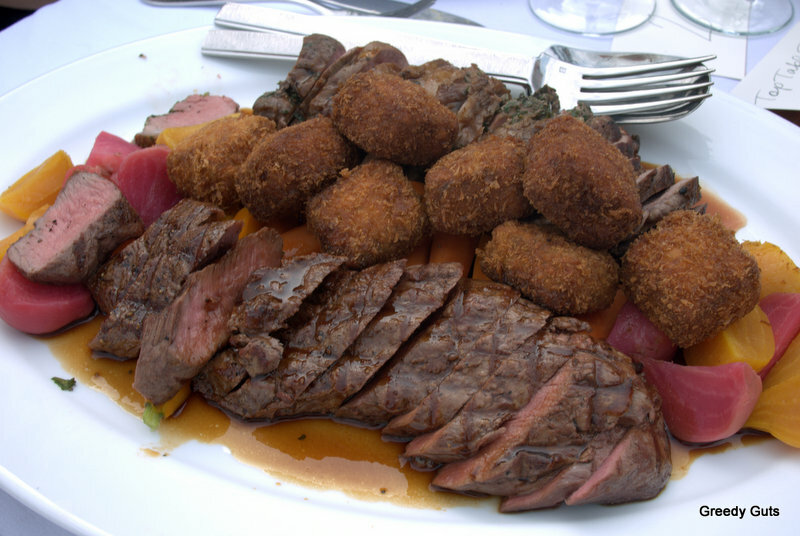 Thoughts: I was in heaven – beef that falls apart on touch and melts in your mouth, paired with a fresh, robust red. What more could you ask for? Course 5: Moonstruck White Grace Cheese Souffle. Topped with arugula, rosemary, and shallot cream. Wine pairing: Antinori “Pian delle Vigne’ 2006, Brunello di Montalcino, Italy. 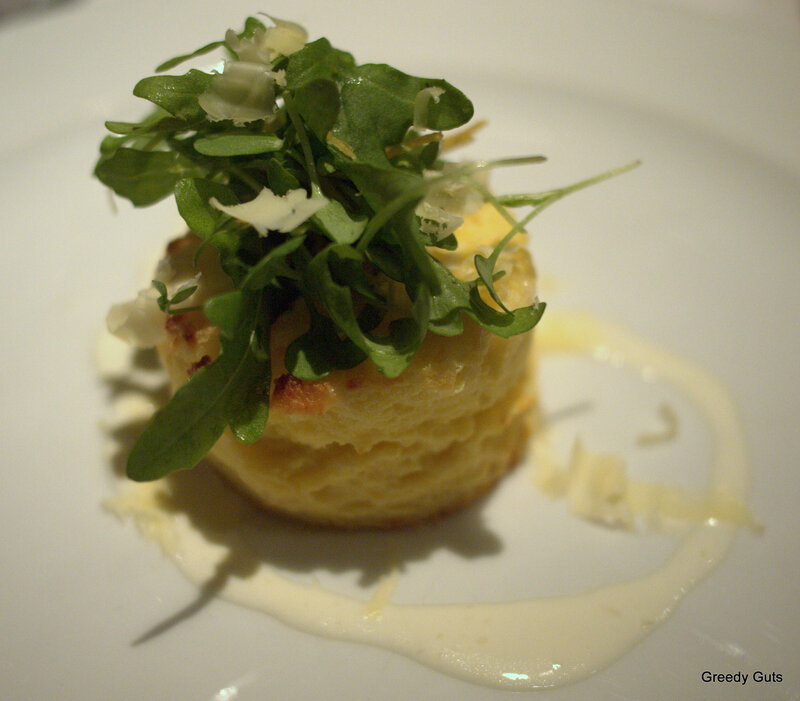 Thoughts: It’s hard to get a souffle right, but Araxi did. 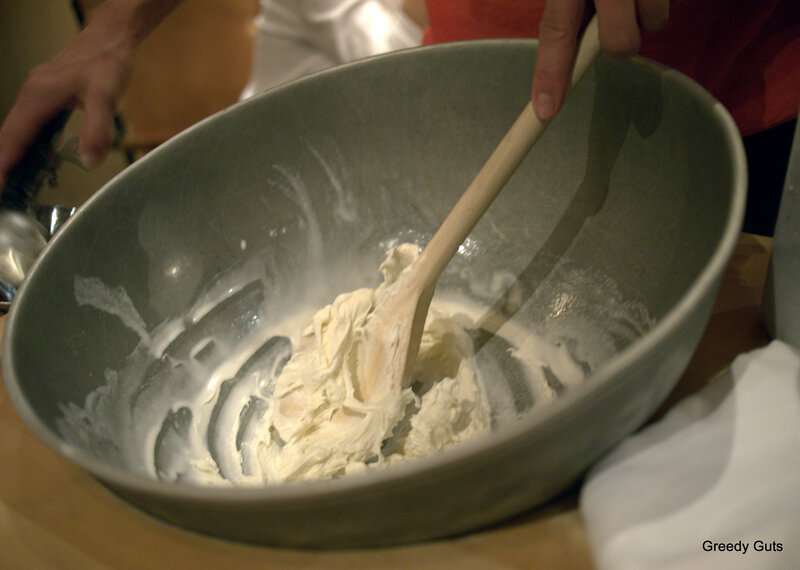 It was probably the least memorable dish however, just because the dishes before it were so much stronger. The Brunello wine and the wine served with the beef, were my two favourites (along with the Champagne). Course 6: Valrhona Manjari Chocolate. Dark chocolate mousse with hazelnut and chocolate crust, raspberry gel, and mint syrup. Wine pairing: Fonseca “Vintage Port” 1985, Portugal. 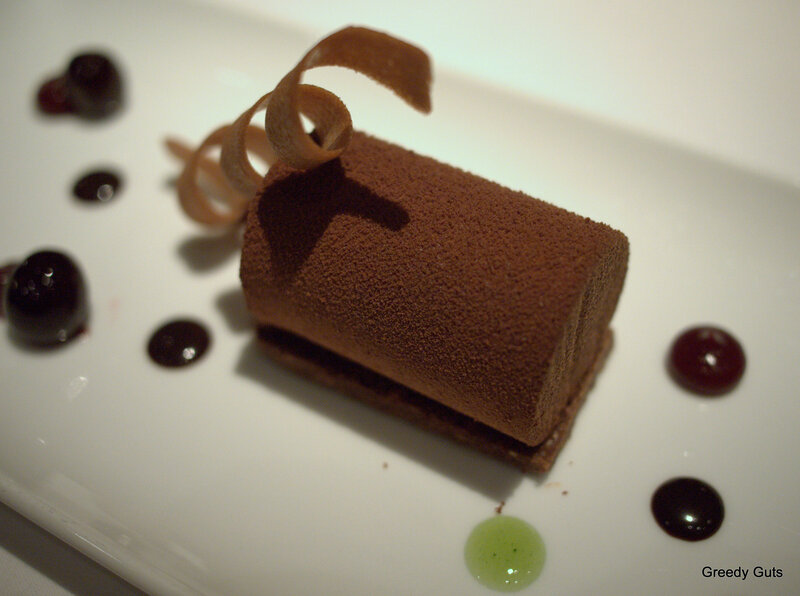 Thoughts: It has been my experience that Araxi excels at desserts. My regret was being so full by this point that I couldn’t finish this delicate mousse. Damn it! 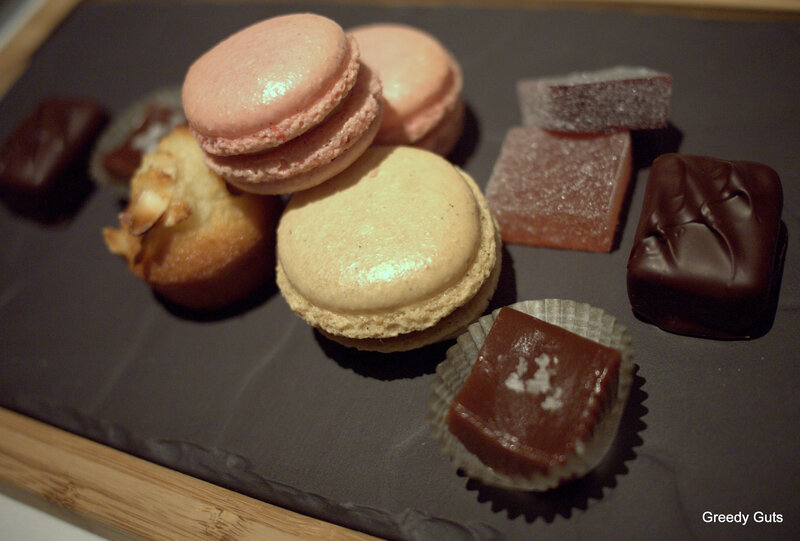 It could have also had something to do with shoving many of the petit fours in my mouth. I can’t help myself!! If you are someone that enjoys food and wine, you really should try to make the effort to get to Whistler next year for Cornucopia. Yes, some of the events will break your budget (Big Guns was $250 before taxes), but Cornucopia also has events for all budgets, including free events. If you do have a bit of extra money to splurge, I would highly recommend Big Guns. Both times that we have been we have been so impressed with the level of service and the quality of the food and wine. Paying for it all beforehand and knowing that you don’t have to worry about it on the night, also adds to the enjoyment. Big Guns is truly the time to kick back and prepare to be spoiled. Things to do this Fall: Cornucopia! It’s almost the middle of October and here on the West Coast of Canada the grey clouds and cooler weather have rolled in. It’s hard not to get a little down about the change in the weather but, on the bright side, we did have a great run of sunshine! In an effort to avoid getting blue, I’m going to focus on the good things that are coming up over the next few months; Halloween, Christmas, a trip to Las Vegas, and Cornucopia! You might remember that November is the month that Whistler celebrates its food and wine festival, Cornucopia. This year is no different and from November 7 until November 11, Whistler will be buzzing with the hum of excited foodies and wine connoisseurs. Last year was my first year at the event and we had a blast attending two events, Araxi’s Bubbles and Oceans, and Araxi’s Big Guns Dinner. Big Guns was an epic feast with wine pairings that was easily one of the best meals that I had last year. It did take some convincing, especially as we just returned from New York, but we just booked our tickets to the Big Guns Dinner again this year! Spice roasted yarrow meadow duck breast served with a pheasant and duck boudin blanc (sausage). Stuffed truffle gnocchi with house made ricotta cheese, potato foam, and a quail egg. 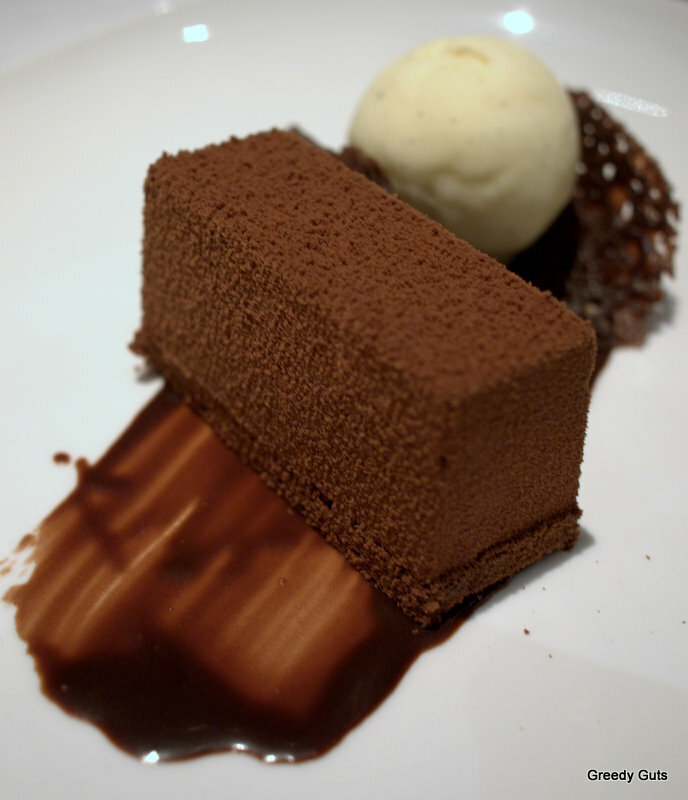 Valrhona nyangbo chocolate with vanilla bean ice-cream. Considering what a great evening we had last year, I am really looking forward to it again this year. If you find yourself looking to kill some time (and money) before the snow season starts, plan a trip to Whistler. 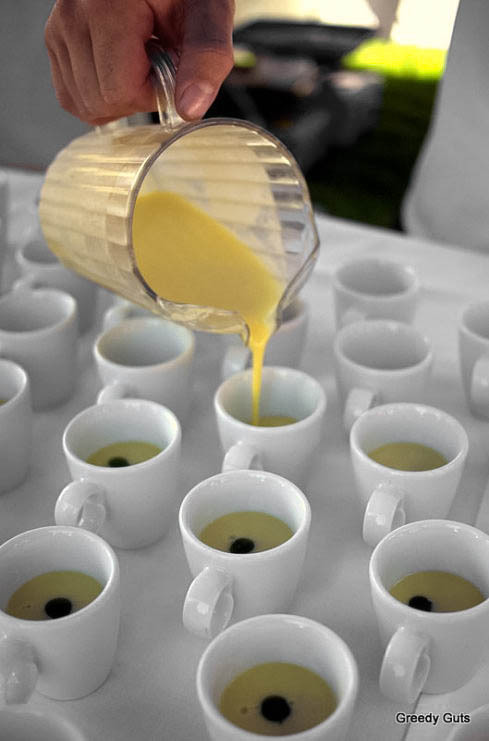 Cornucopia has a huge variety of events, including wine seminars, gala events, farm trips, night markets, artisan markets, and chef dinners, so there is something for everyone, and every budget. Brief Description: An upscale European restaurant with a particular focus on local produce, including produce from the lodge’s own garden. The lakefront location is stunning, as is the food. Prices are mid-range but the quality bar is high. Whilst visiting Whistler for the Araxi Long Table Dinner, we decided to add a much-anticipated return visit to Aura restaurant to our itinerary. After a gorgeous drive up on the Sea to Sky, we pulled into Nita Lake Lodge at about 7pm and were sitting on the lakefront patio an hour later. 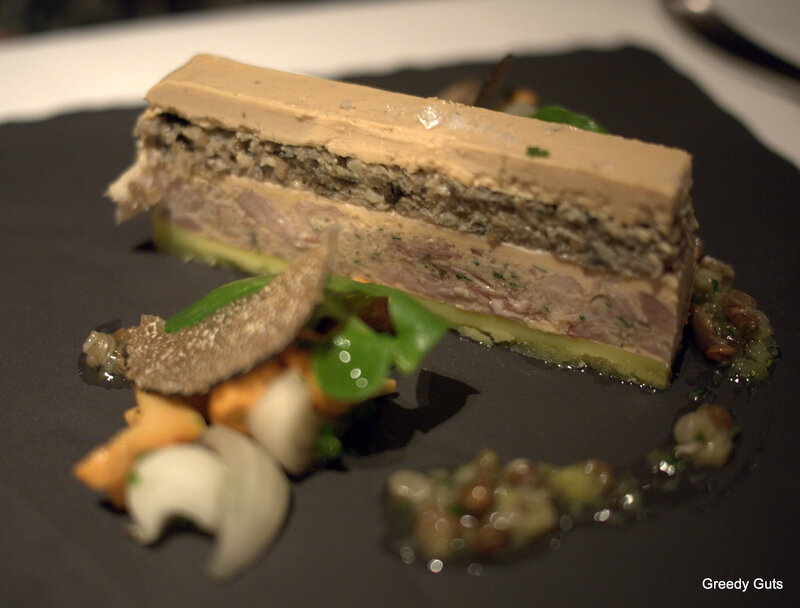 We couldn’t pass up the opportunity to indulge in the five course tasting menu for $65 each. 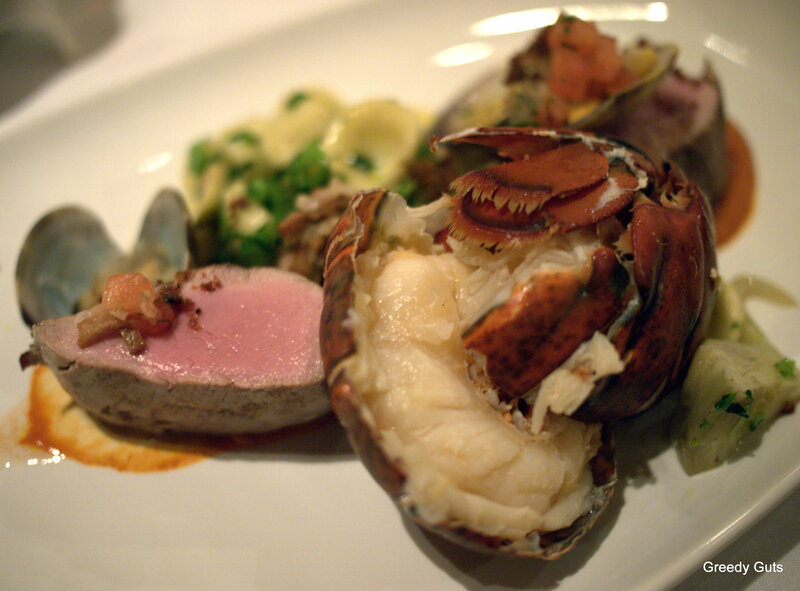 Considering the quality of the food that we received, I felt that the tasting menu represented great value for money. Wines by the glass, on the other hand, were a little on the pricey side. The view throughout our meal. 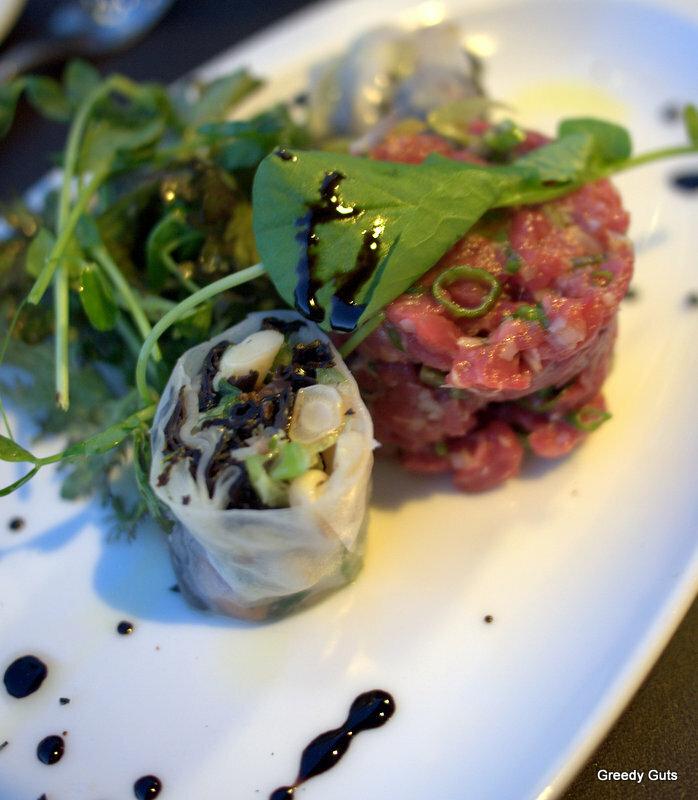 Second Course: Beef tartare and mixed mushroom parcels. 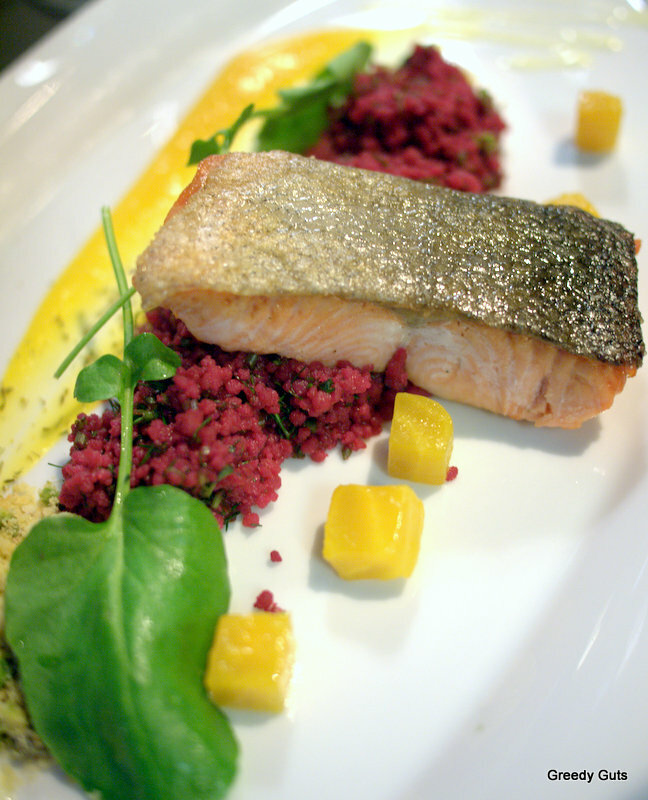 Third Course: Roasted wild BC salmon, golden beets, fresh herbs and beet couscous, crème fraiche, pistachio and houseradish crumble. 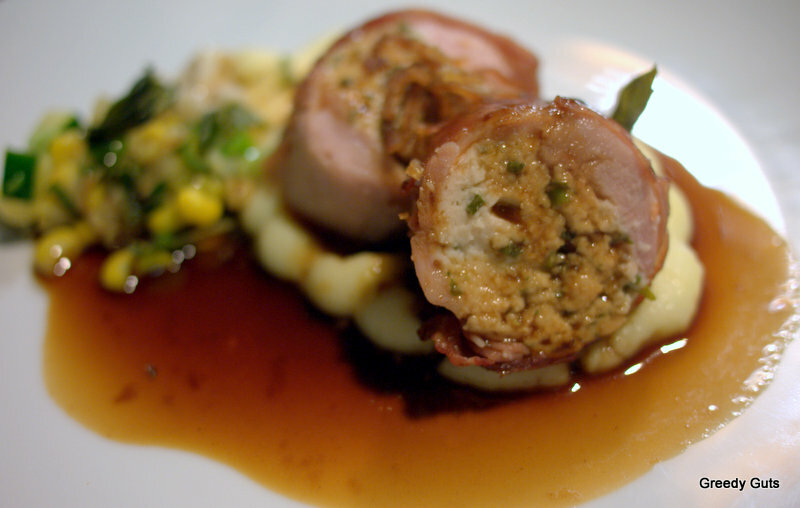 Fourth Course: Prosciutto wrapped chicken leg filled with herb mousse and served with grilled corn, leeks, buttermilk mash and whiskey jus. Fifth Course: Vanilla bean pannacotta, with blueberry sorbet, coconut, lemon and raspberry. 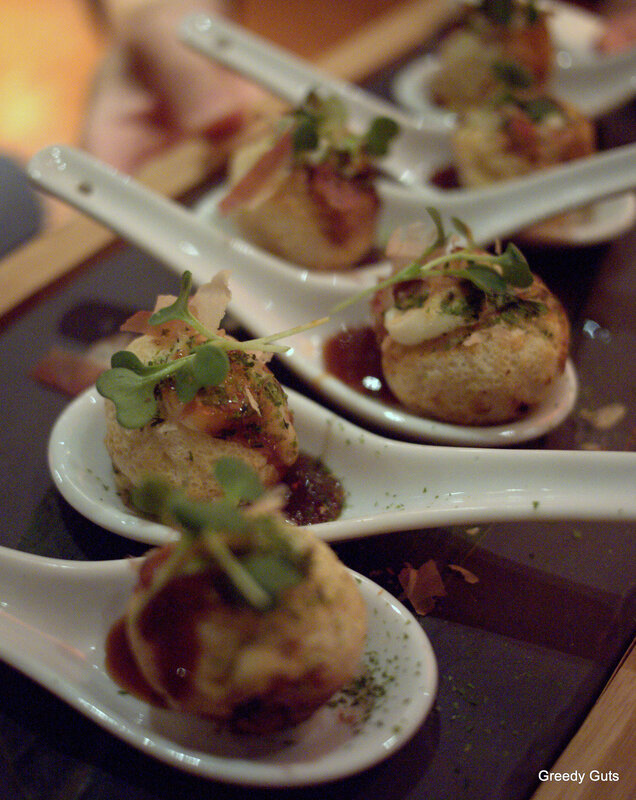 All of the dishes were wonderfully executed but there were two dishes that really stood out for me. One was the prosciutto wrapped chicken leg, as it was succulent yet with a slight crunch thanks to the prosciutto. The other dish was the dessert. The reason for this was due to the balance of texture and the combination of flavours. 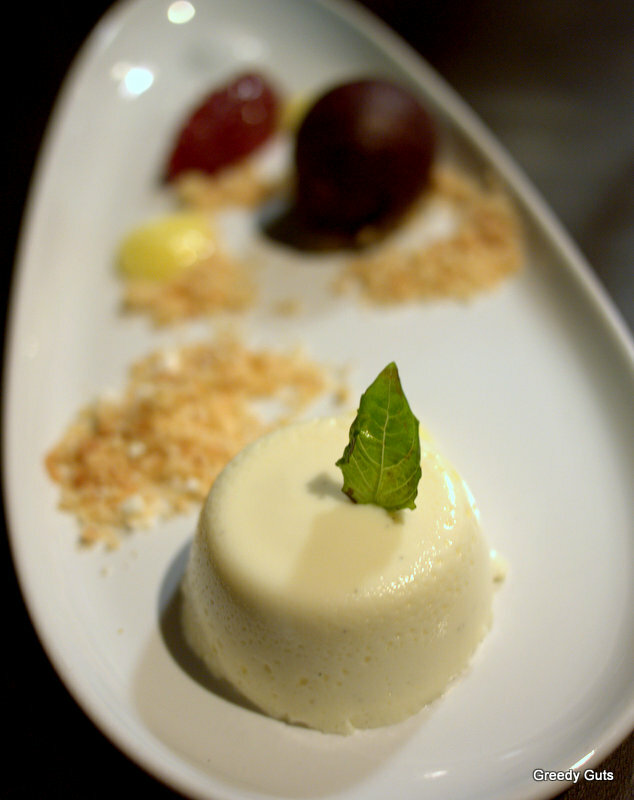 Within each bite, you had the creaminess from the pannacotta, a tang of lemon and raspberry, and a slight crunch from the toasted coconut. I recall that our dessert from the last time we were at Aura, a de-constructed lemon meringue dish, was also outstanding. The service had improved quite a bit since our last visit. Our server’s friendly, laid-back style helped to create a relaxing dining experience for us. The interior of the restaurant is decorated with the lodge ambiance in mind, so think lots of wood and stone. But, trust me, if you are outside you will only be looking at the view and not worried at all about the decor. 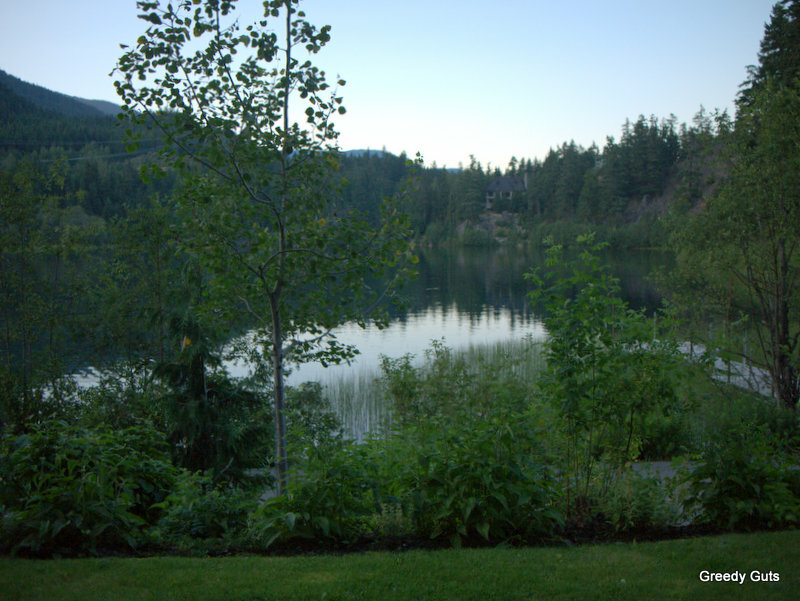 It is a great spot for a quiet, romantic dinner as it is far away from the hustle and bustle of Whistler village. Last week B and I celebrated our second wedding anniversary – exciting stuff! To celebrate, we spent this past weekend in Whistler where we stayed at Nita Lake Lodge, the gorgeous lake-front hotel where we tied the knot. Besides celebrating our anniversary, we were especially motivated to visit Whistler on this particular weekend so that we could partake in Araxi’s Long Table Dinner, an annual event that we also attended last year. This year’s Long Table Dinner was held at a different location than last year’s dinner, and so we spent Saturday afternoon at Rainbow Park, just outside of Whistler. 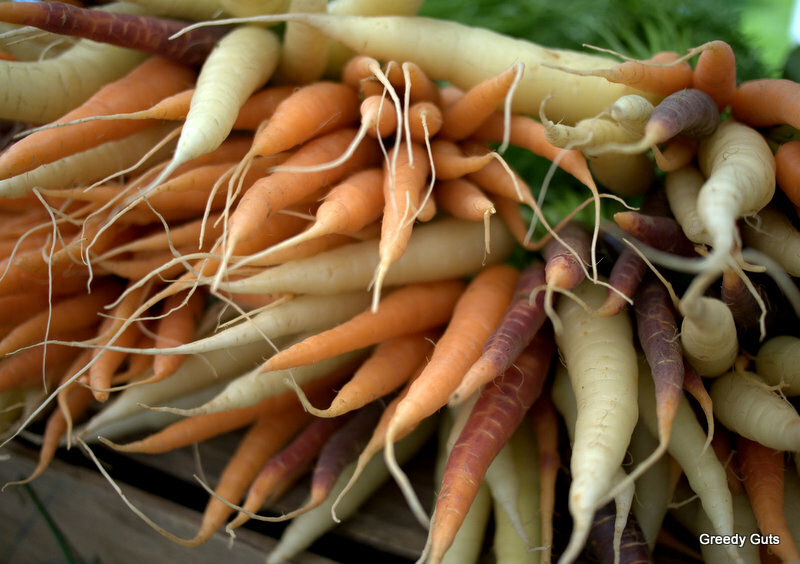 In addition to the four-course dinner with wine pairings ($175pp), there was also a small market on-site that offered produce from local farms, such as Rootdown Organics and North Arm Farm. Colouful produce that was available from the small on-site market. 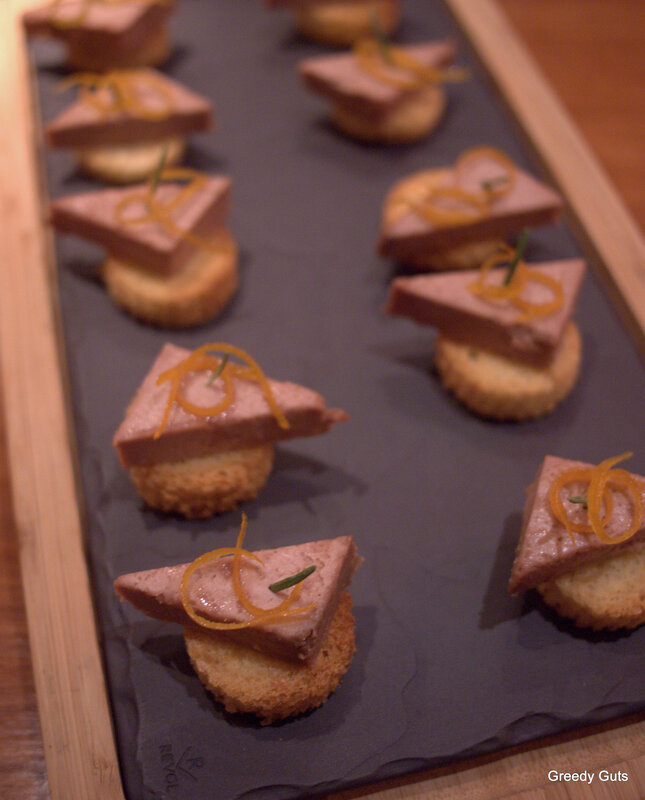 Although the menu didn’t differ much from our Long Table Dinner experience from last year, the food and drinks were the typical high-quality that I’ve come to expect from Araxi. 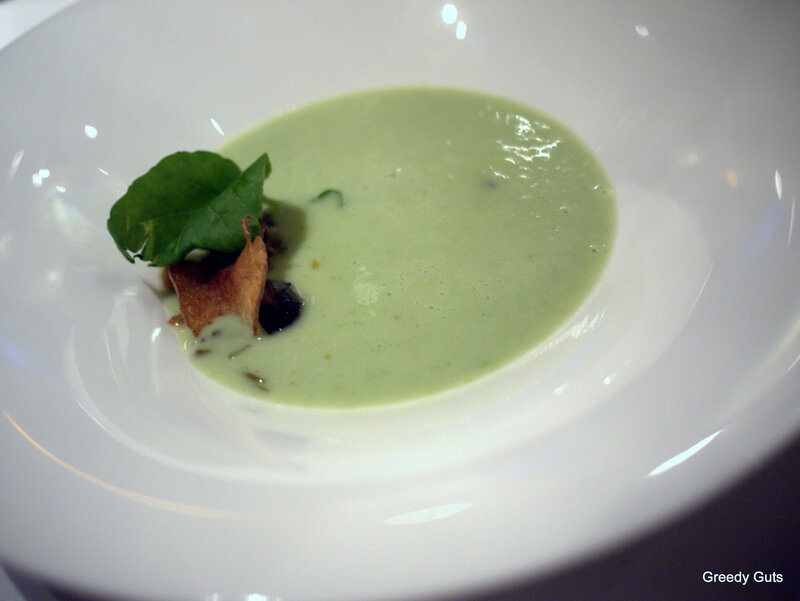 …and the chilled Fraser Valley corn and basil soup. 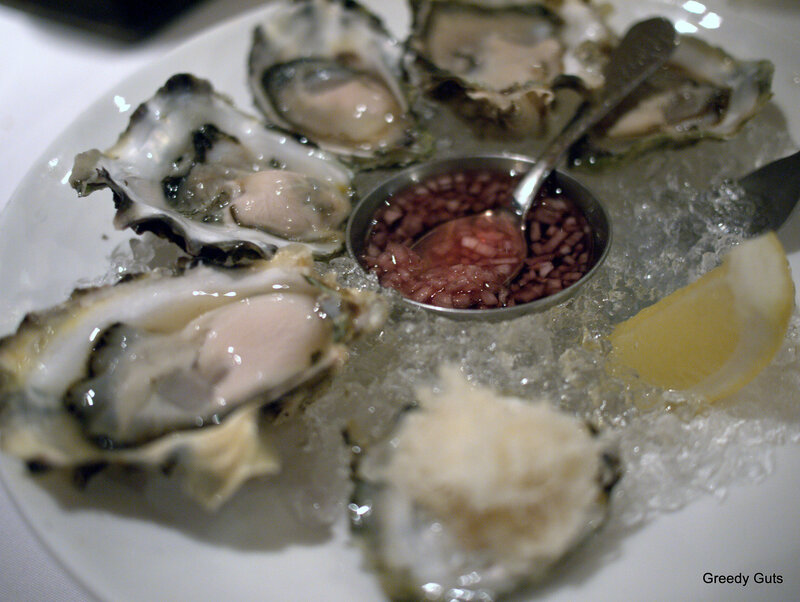 The oyster bar was a new addition to the line-up. 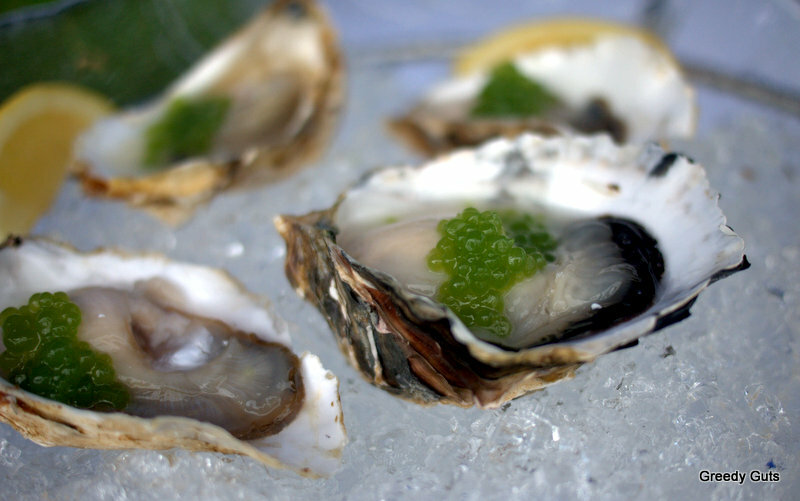 On a hot day, chilled oysters with cucumber pearls felt quite indulgent. Executive Chef, James Walt, putting the finishing touches on the first course. First Course: Heirloom tomatoes, buffalo mozzarella, organic greens, basil and gazpacho vinaigrette, and tomato chips, paired with a glass of Mission Hill’s SLC Sauvignon Blanc 2010. 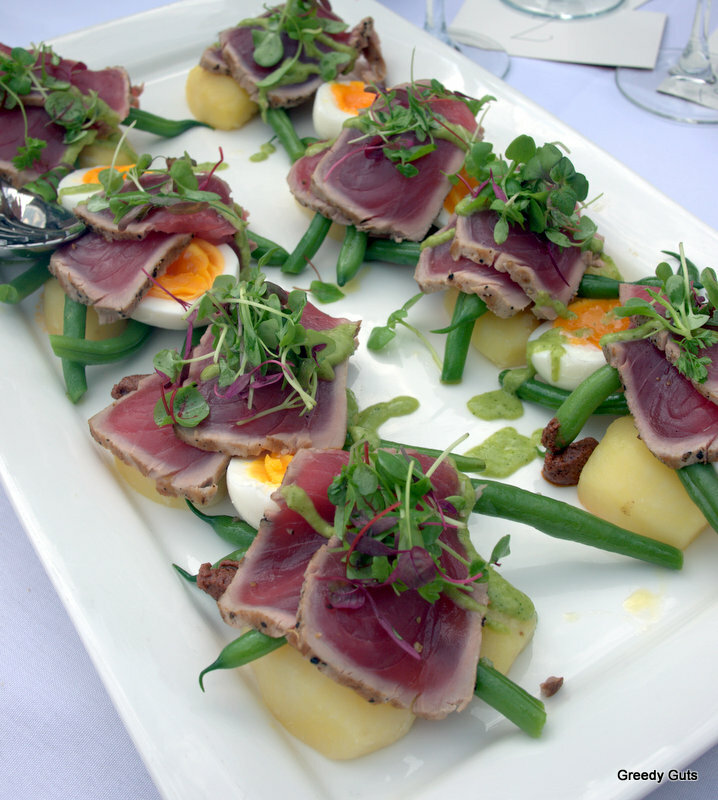 Second Course: Red tuna salad with butter potatoes, green beans, salsa verde, organic olive tapenade, and eggs. I really liked the way that they portioned this dish this year. The tuna salad was served with a Martin’s Lane Pinot Noir 2010. 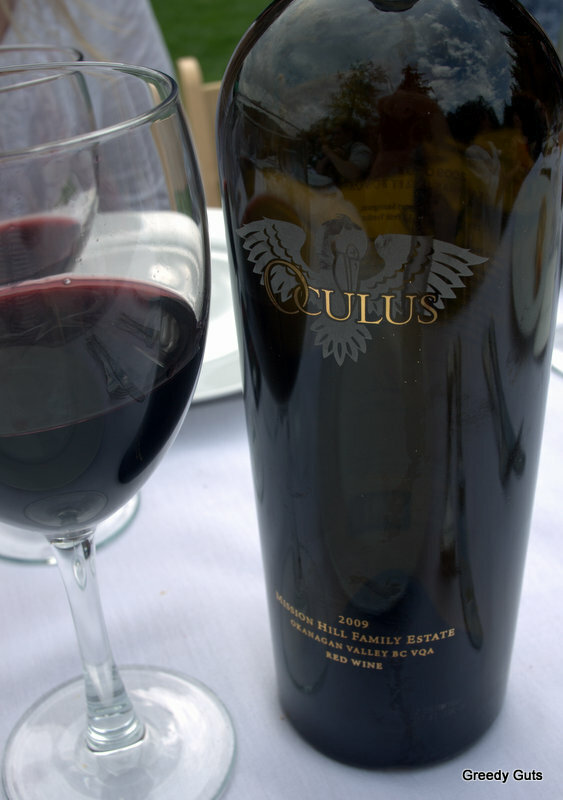 …Mission Hill’s Oculus 2009!! B and I were both pretty excited when we saw the representatives from Mission Hill winery decanting this wine earlier in the day. I’m not sure if you recall, but I recently blogged about buying a bottle of this fabulous wine whilst in the Okanagan. 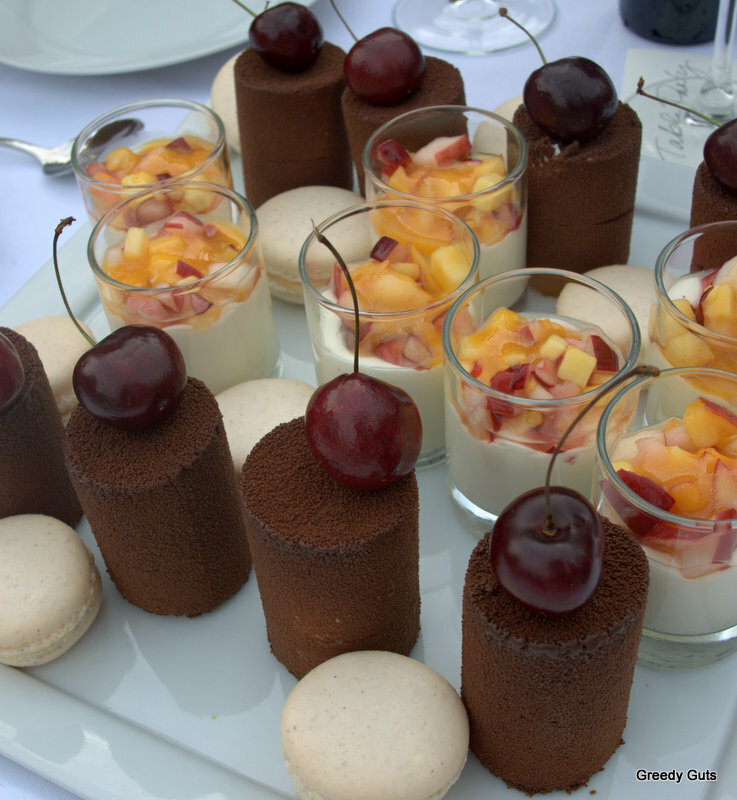 Fourth Course: Black Forest cake with cherries, buttermilk and vanilla pannacotta with peaches and nectarines, apricot macaroon, and there were some jelly pastels. Dessert was paired with another Mission Hill wine, the Reserve Riesling Ice Wine 2011. The views weren’t as spectacular as The North Arm Farm location but, on the plus side, it was much closer to Whistler than last year. The Long Table Dinner series is over for another year, and I’m glad that we attended again. It is such a relaxing, fun day and I find that, besides the food and the wine, the best part of these dinners is meeting interesting people from all walks of life, including the local suppliers that provided the delicious ingredients that were used in the meal. 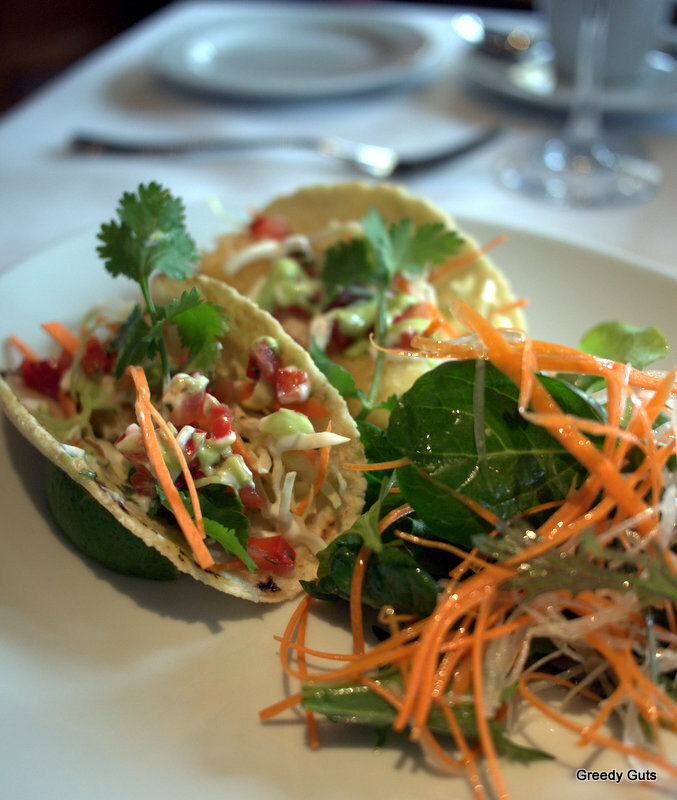 Brief Description: One of Whistler’s most popular restaurants. 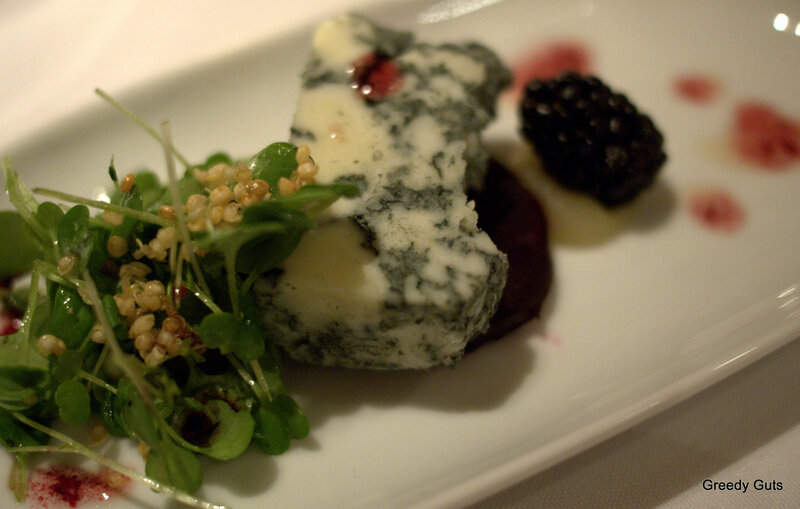 Araxi is a formal restaurant that prides itself on offering good, local food. Prices are in the mid to high range but well worth the price. Happy belated Canada day! I was away camping glamping for the long weekend and, even though it rained the WHOLE time, we still had a great time up at Birkenhead Lake (past Pemberton). 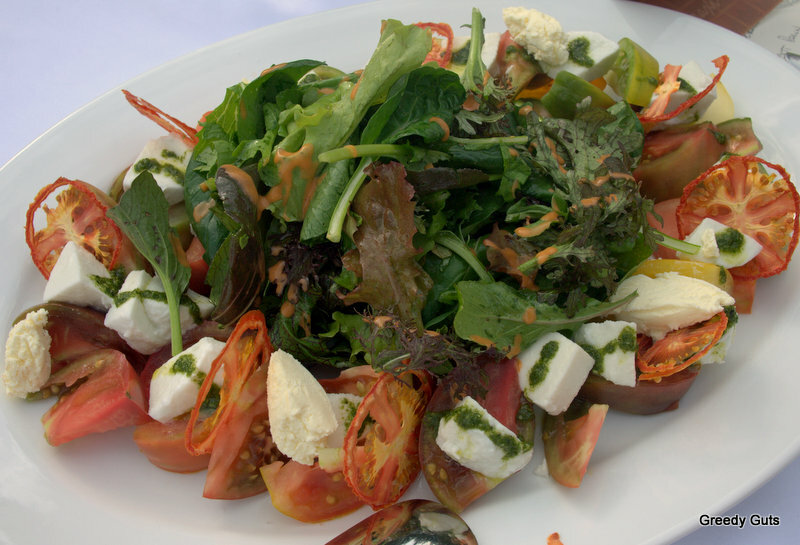 As seasoned glampers we are well-prepared to ensure that we eat really well whilst away. However, even we were unprepared for the epic start to our glamping weekend. The morning began innocently enough with freshly baked scones, strawberry custard danishes (oh hell, yeah!) and croissants from Cadeaux Bakery, before stopping by Revolver for a steamy hot latte to clear away the brain-fog. In between bites of danish and scone (seriously, you gotta try the seasonal strawberry custard danish), and sips of coffee, I was scrolling through my twitter feed when I saw that Araxi had opened their patio for the summer season. What perfect timing! Knowing that I was sharing the ride up with other serious foodies, I happened to casually mention the tweet and with one shared look, we made plans to stop at Araxi for lunch. Yes, I’m a glutton. Oh, did you not know that already? Araxi is easily one of my favourite Whistler restaurants and, having only been there for dinner, I was looking forward to trying it out for lunch. The menu appears slightly more casual for lunch than the dinner menu yet the Louis Lake Steelhead Salmon, with a side of lemon chives risotto, was still impressive. 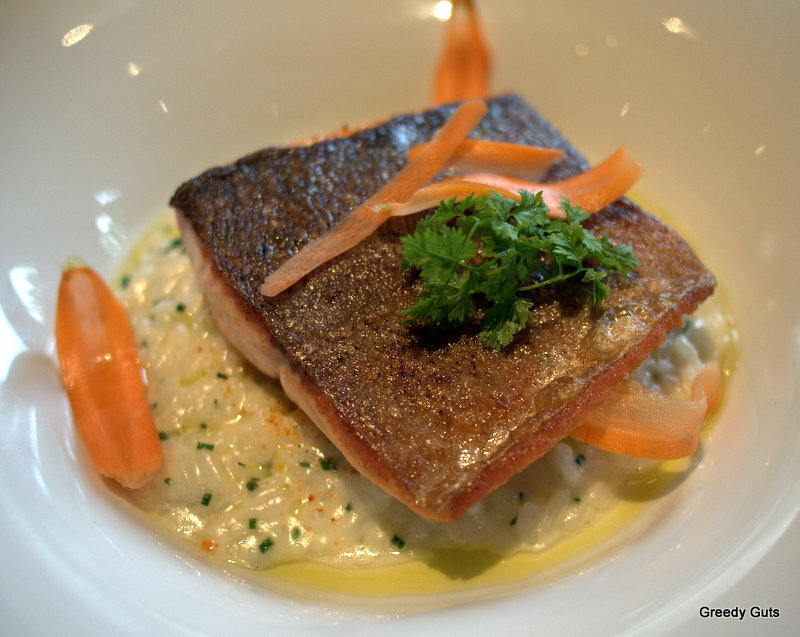 The fish, perfectly flaky atop the bed of creamy risotto, was a highlight. At $19.50 it was certainly well-worth the drive. Other dishes at the table were the Halibut Tacos and the BC Albacore Tuna Tataki with daikon radish, shiso, cucumber pearls and ponzu. To me, although extremely tasty, the tacos seemed a little out-of-place for the refined Araxi. 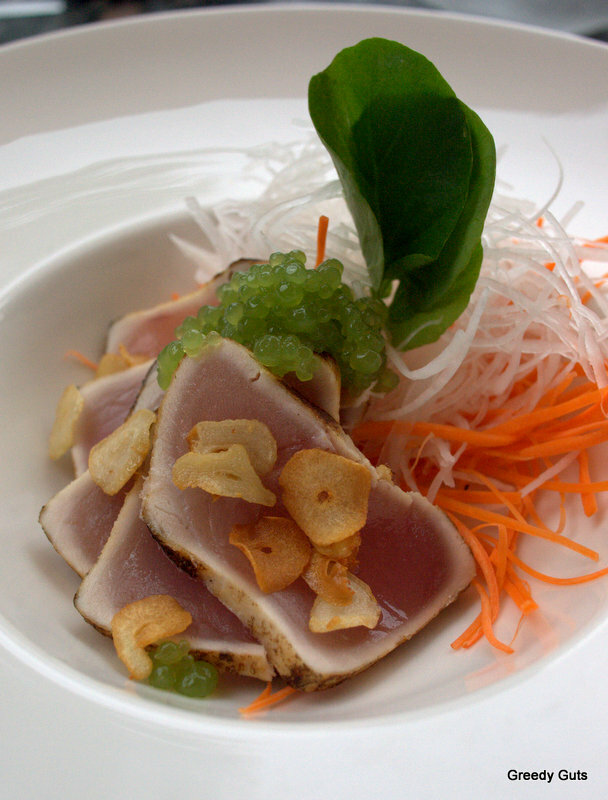 BC Albacore Tuna Tataki with daikon radish, shiso, cucumber pearls and ponzu. Final Thoughts: Not only is Araxi open for dinner, but they also do a Sunday brunch and, for summer only, their patio is open from 11am to 3pm for lunches. Personally, I find the prices are actually quite reasonable for the quality that you get. My lunch, including a glass of bubbles and the steelhead came to $35, including tax and tip.